Republican candidate of US Presidential elections, Donald Trump challenged North Korea's head Kim Jong-Un in an open fight of sumo wrestling before proving his worth as a president of United States of America. Both will fight in WWE ring and would try to eliminate each other from this deadly earth. Kim Jong-Un has accepted the challenge while Trump has shown his excitement. "This deadly battle is to save the planet from deadly aliens landed in North Korea. First I will f**k the hands of Kim, lift him over my head would throw him into the audience of United States of America. 'This is my battttttllllllleeeeee'," said Donald "First I will prove my candidature by eliminating Kim then after becoming President I will challenge Pakistan's Prime Minister Nawaz Sharif, another different planetary substance." Another candidate Hillary Clinton has challenged ISIS head Abu Bakr al-Baghdadi in a sumo wrestling championship. Before the real fight she will have practice match with existing US President Barack Obama to try her punches and kicks on. 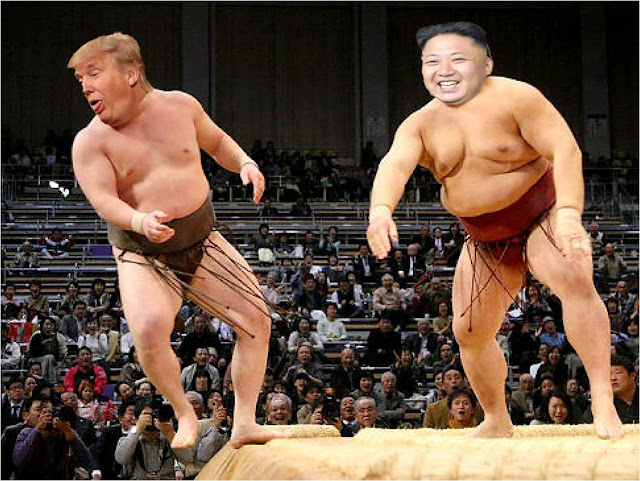 0 comments for "Donald Trump challenges Kim Jong-un in open sumo wrestling fight in a final attempt of US Presidential elections"